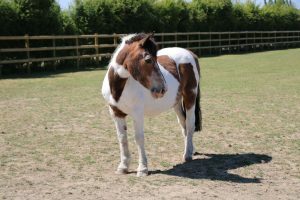 Sparky’s weight loss progress is good and he is currently looking a good weight, although he is a little disappointed that this doesn’t mean he is allowed any extra feed at night time for doing so well! Sparky and his buddies have moved field, so he is allowed a little more grass. He isn’t so sure about his new neighbours that are the donkey girls’ group as they are a lot nosier than what he is used to but he is beginning to get used to it. Sparky has joined the ‘waistline watching club’ as he has put a little extra weight on too. He is having less feed and now the weather has warmed up slightly, he isn’t wearing his rug. Sparky and his friends have been enjoying the sunshine and are starting to look forward to the spring! We are so pleased with Sparky! He is doing really well and has even managed to put on weight. His body condition score is now perfect for this time of year. Well done Sparky! He and his friends have also enjoyed the fresh top up of sand on the pad, they all rolled in it to show how grateful they were! 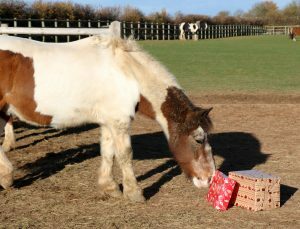 Sparky has been looking forward to the New Year, he has also enjoyed watching all the visitors take part in our Christmas activities, especially when Santa Claus made an appearance or two! He has had a lot of his fans come along and visit him throughout December, which was the perfect opportunity for him to show off his new rug. He is also adamant that he is to be fed first in the morning and is always at the front of the queue. This does mean he is always the first one to finish his food as well though, but thankfully he allows his friends to finish their food in peace! Sparky like many of his friends has had his feed increased to help maintain his weight through the winter. 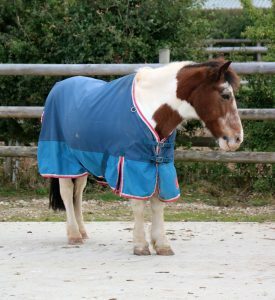 He has also has a thicker rug on to keep him warm which he appears to be very grateful for! He and his friends are receiving extra hay now that the grass isn’t so nutritious and Sparky is always first in the queue when it comes to adding more hay in! For any supporters who have been to visit him lately, they will probably notice that he is starting to look his age, getting a little greyer especially on his face, however he certainly isn’t acting his age! Sparky has started to have a bigger breakfast and an additional tea time feed, which some of his friends are very envious of but of course Sparky is delighted with! He has also started to need a rug as it has been getting cooler which he has been very accommodating for. Sparky only started to need a rug in recent years so was quite nervous of this to start with. The team took it very slowly and introduced it to him quietly and he is now more than happy to have a rug on whenever it is needed. 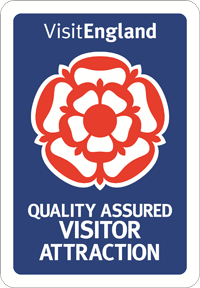 Sparky has been very pleased with the number of visitors coming to see him through half term and was more than happy to take part in the spooky goings on! Sparky has been feeling the change in the weather and has started to wear a rain sheet at night for a little extra warmth, and has had his feed increased to keep his condition. 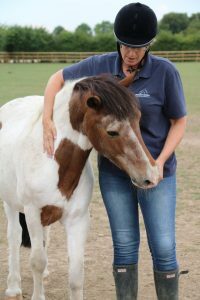 Although, the colder weather didn’t stop him from meeting his fans at Autumn Fayre at the end of September, where he waited patiently to have a cuddle with anyone who was passing his field. Sparky has had another visit from the vet who performed his surgery, thankfully it was all good news this time and was very happy with him. His butty is still going down very well in the morning and he is always waiting at the gate before the rest of the group to make sure staff don’t forget him! 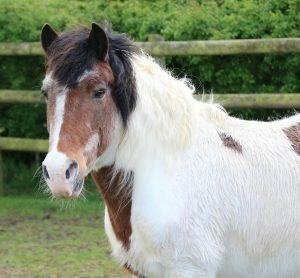 Sparky has recently taken part in an adoption day, where he met a lot of his supporters and was very well behaved for it. 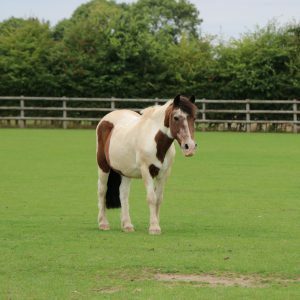 Although Sparky has recovered from his surgery, staff continue to monitor him for any changes in behaviour and health in order to stay on top of things. He is enjoying this fact and adores the fuss he has been receiving from everyone after they heard about his surgery. 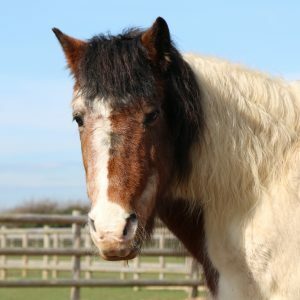 Sadly, not many people have adopted Sparky this month but staff are hoping his dashing good looks and sweet nature will tempt a few new faces as they visit over the holidays. Sparky has had some extra visits from the vet including laser surgery to remove the sarcoid on his sheath. He has been a great patient throughout and has been waiting at the gate every morning for his medication in a butty! He has now fully recovered but will still receive daily medication to reduce the risk of another outbreak, which he is very pleased about! Sparky was also part of the adoption day where many of his fans came to visit him and give him a cuddle. Sparky has had a lot of attention from the vet following laser surgery on his sheath but he has recovered well and the vets are pleased with his progress so far. 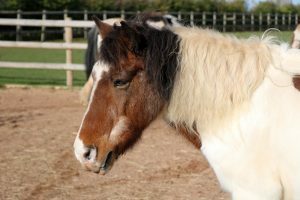 Sparky has taken it all in his stride and has also enjoyed having his extra feed in order to have his medication. 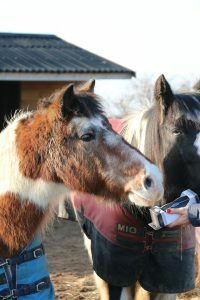 Sparky also had a visit from the dentist for his annual check-up, where he behaved impeccably and his teeth were in good order. 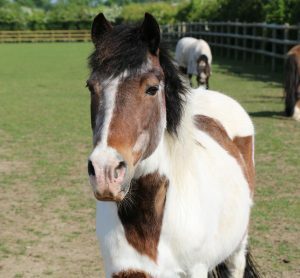 Sparky has enjoyed seeing the visitors over the Easter Holidays and can’t wait to meet more at his adoption day on Sunday 24th June! Sparky has developed a squamous cell carcinoma in areas of his sheath and although it isn’t causing any pain at the minute there are plans for it to be treated as soon as possible by laser. He has been a fantastic patient for the vet to examine and looks like he has enjoyed the extra attention from welfare staff. 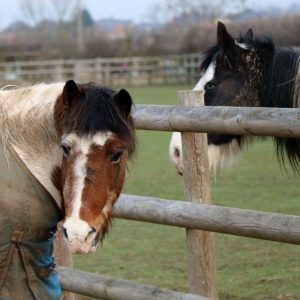 Sparky has found a firm friendship with Jigily and the pair are never too far from one another. Spring is on its way and Sparky has now stopped having his additional food as the spring grass will start coming through. 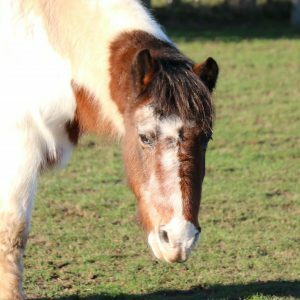 Sparky has started to be a little cheeky and enjoys playing games when he needs to be caught for the farrier which is keeping the staff on their toes.